In what could be a case of digital video ad marketplace role reversal, TV is taking share from digital, albeit over-the-top. That’s the conclusion of equities researchers at BMO Capital Markets, based on briefings with key players in the advanced TV and video ad markets. While conventional TV advertising remains resilient -- and if anything, appears to be propped up by Madison Avenue’s legacy view of the medium -- the BMO analysts report the over-the-top video advertising marketplace is accelerating rapidly. Citing estimates from Innovid, OTT video ad spending is on track to expand 300% and will account for roughly 20% of all video ad dollars served by the company this year. 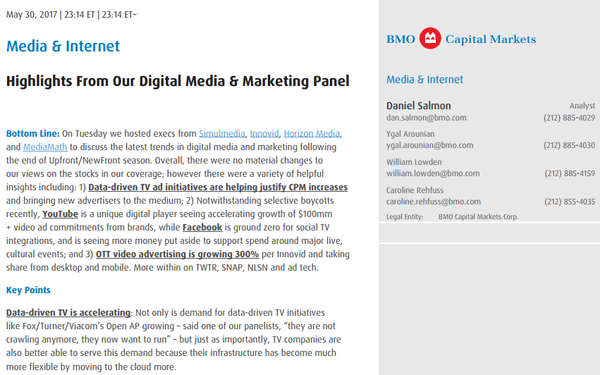 “We believe OTT marks an opportunity for both traditional TV players (particularly as products featuring their networks like Sling TV, DirectTV Now, YouTube TV and Hulu with Live TV get early traction), as well as pure-play digital ones, like YouTube, as they are native to the underlying digital experience,” the BMO analysts write in a note sent to investors. The note points out YouTube’s share of the market declined “due to the advertiser protest,” especially among large brands. “There was no clear-cut trend as some large advertisers cut spending completely, some pulled back and have now returned, and some spent more as competitors pulled spending,” the analysts wrote.